I had heard about fried squash blossoms for years but never tried them until this summer. Since I compost our garden spot during the year, there are lots of “volunteer” plants that come up. This summer, I had an abundance of squash coming up every where. Literally, they were taking over the garden! So one morning I pulled out some of the biggest vines which were full of blossoms. I pitched the vines and pulled off the huge blossoms and put them in the skillet. Wow was I surprised! What a taste sensation! Actually the flavor has a earthy resemblance of mushrooms. When lightly fried in olive oil, it releases a delicate subtle fragrance which pared perfectly with my eggs and bacon. 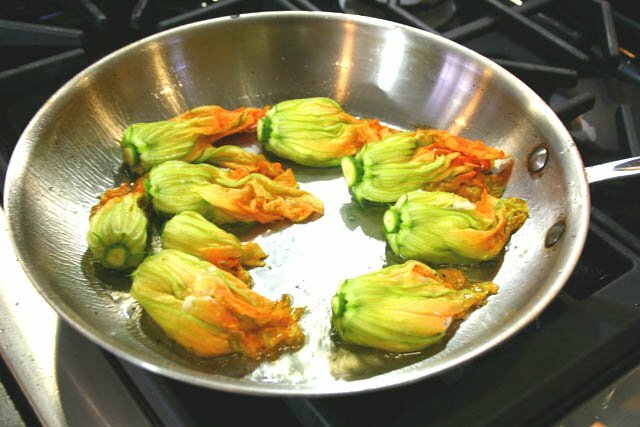 Gently fry blossoms until lightly browned and crispy. Salt to taste. Serve hot. Leann! My grandmother used to fry these up every summer! Welcome to an Italian summer home! Yum! My mouth is watering!